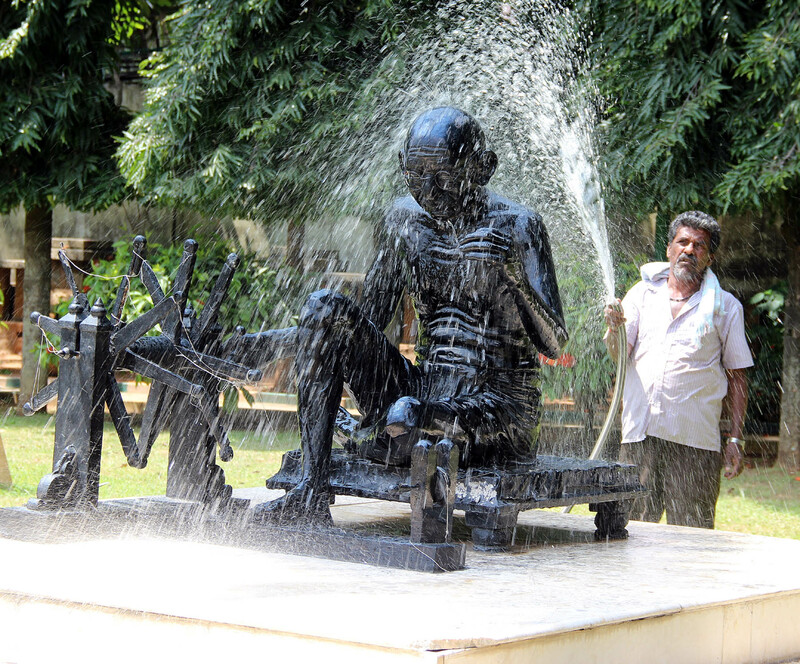 As the “fodder of the nation” gets set to spend some lonely nights facing a blank wall, the father of the nation gets a neat scrub on the eve of his 144th birth anniversary, in Bangalore on Tuesday. This entry was posted in Mysore-Bangalore and tagged Churumuri, Gandhi Jayanti, Karnataka Photo News, KPN, Mahatma Gandhi, Mohandas Karamchand Gandhi, Sans Serif. Bookmark the permalink. ‘Fodder of the nation’ – super. GANDHI STATUES AROUND THE WORLD…..MORE THAN 70 OUTSIDE INDIA…..THIS MAN IS THE ONLY GLOBAL LEADER! (not only because this is giving info about Gandhiji– – that is an amazing collection. And while watching, you get a kind of satisfaction– the realization that at least this man from “our group” is admired by the world. (is it the same feeling one get when a Rajkumar fan see Rajkumar movie is getting record audience?.. or Rajnikant fans feeling proud when his movies are getting record collection outside India too?). In fact it is a mixed feeling of hollow pride + the pleasure we get by traveling to different places + a tea-spoon of patriotic feeling = it is nice to watch this wonderful collection. Thanks. It is really nice to see, how neatly they have maintained those Gandhi statues in different parts of world. I like meditating Gandhiji statues., most… That is our Gandhiji, who taught us to look within our own soul. And not to blame others. Not to shower our sadistic feelings on others… Lucky are those people who got a chance to live in his Ashram, even for a few days…. I really felt sad watching all those statues — Dont mistake, Not out of patriotic feelings.. To be honest, I was thinking, when I will get a chance to see all these places in real. Gandhiji has gone to all these places… without even taking an air ticket….